Any one familiar with twitter may have seen the recent hash tag for the 1st World Conference on goring pain in athletes (#Groin2014). 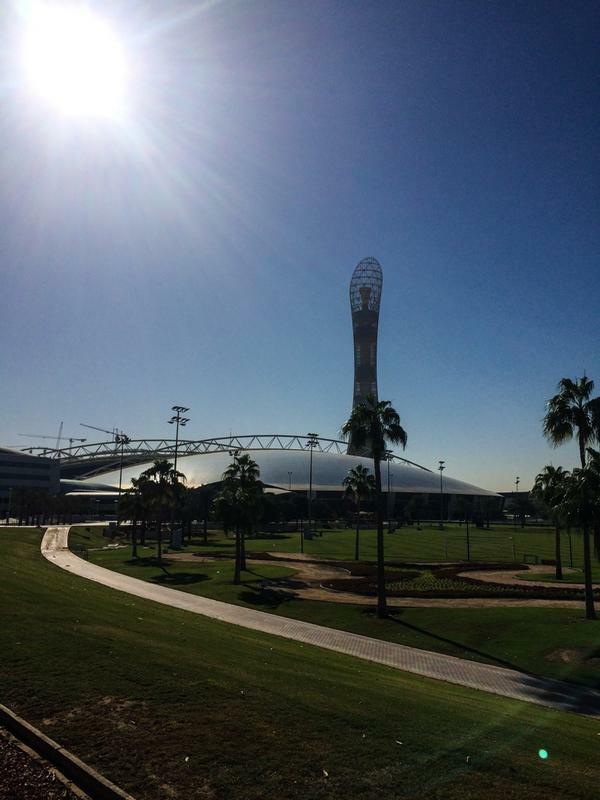 This conference in Doha, Qatar was brilliantly orchestrated by Adam Weir (@AdamWeirSports) and his team at Aspetar. Run over three days and cram packed with information, I’m going to try and summarise the points that I found most interesting and thought provoking – please be aware these are my interpretations of what other speakers said and do not serve justice to the quality of the talks and presentations. What quickly became clear through the presenters was that even in 2014, we categorise injuries far too broadly. Consider the structures involved in the “Groin” and its no wonder why this area of the body see’s such huge injury occurrences. Also, our terminology needs to be more accurate. Per Holmich (@PerHolmich) brilliantly said “Pubalgia is as specific as saying Kneealgia” we need to be more concise with our terms if we are going to understand the pathologies and management better. Of 110 multi-sport athletes assessed by Andreas Serner (@aserner), 76% of these injuries occurred in football-code sports. Markus Walden’s (@MarkusWalden) systematic review of 12 papers found that “Groin injuries” accounted for 9-18% of all injuries in mens football, with greater time loss of injury seen in tournament football compared to the regular season. Is this because of better monitoring at club level? Where medical teams know the players in a detail that international staff can’t due to limited exposure to players? Or as Walden says, is it due to the acute nature of injuries in tournaments due to reduced recovery and increased fatigue? Both Walden and John Orchard (@DrJohnOrchard) found a greater incidence of groin injuries in men compared to women. It was suggested that the anatomical variance in womens hips puts them at more risk of lateral hip and knee pain rather than groin pain. The inguinal canal deficiency is also greater in men than womens. Walden reports that 64% of groin related injuries are adductor related. This was supported by Serners paper with adductor longus being the most frequently injured of the adductor muscles. 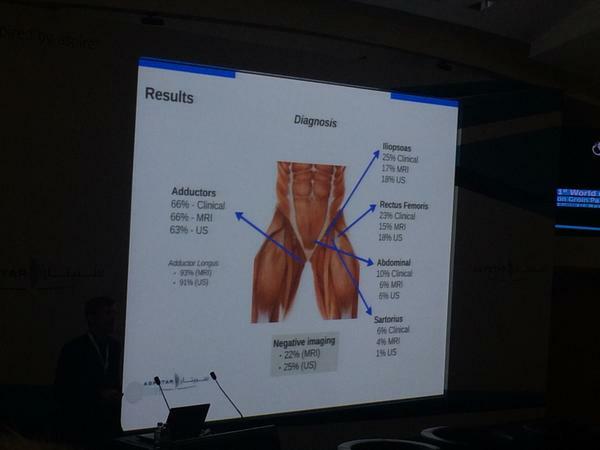 The picture below demonstrates Serners findings that 1/4 of all diagnosed injuries are negative on imaging, and that clinical presentations of rectus femoris & iliopsoas especially, often appear different on imaging. Treat the player, not the scan! Eamonn Delahunt (@EamonnDelahunt) presented his research findings of squeeze assessments and groin pathologies, concluding that 45 degree squeeze has the highest sEMG and strength values (mmHg) of the 3 traditional squeeze measures. Contradictory to Moslers & Delahunts assessment of the adductors, Kristian Thorborg (@KThorborg) favoured long lever assessment when assessing for strength and pain. Pain provocation tests at a 0-degree squeeze is the best assessment to “rule adductor longus in.” While Delahunt drew his conclusions from a small population of gaelic footballers over a 6 month review period, Thorborg presented around 12 of his studies looking into the assessment of groin related pathologies. What is worth considering, is what structures are being affected when testing at these different ranges. As you’ll see below, it is a very complex and integrated part of the body. Anthony Schache emphasised the importance of understanding the anatomy of the groin, in particular the soft tissue attachments. “Antomoy books provide discrete anatomy definitions which implies discrete anatomy – but this is not true.” The image below highlights the intimate attachments of surrounding structures in the groin. Per Holmich was keen to build further on these assessments as part of a clinical diagnosis, saying that adductor pain replicated with stress tests PLUS pain on palpation of the adductor origin (must be “the patients pain”) indicates that the adductors are the main driver of pain – any one identifying factor on its own is not enough to indicate a diagnosis. But, consider what Schache said about the anatomy – we would need to ensure that our palpation skills were incredibly accurate. You can see how being a centimetre out when palpating the pubic bone for the adductor origin could be the difference between adductor longus (AL) or gracilis, or rectus abdominus. For this reason, its important to take your time when palpating this area, although it can be uncomfortable for both practitioner and patient, but confidently & slowly working your way around the attachments could help improve your diagnosis. Of significant interest regarding the adductors is the difference in anatomy. Stephanie Woodley describes the intramuscular tendon of AL as being 23% of the femur length, compared to 11% of femur length for adductor brevis. Also significant is the decreased vascularity of AL, less than that of brevis and both of these are less than that of gracilis. 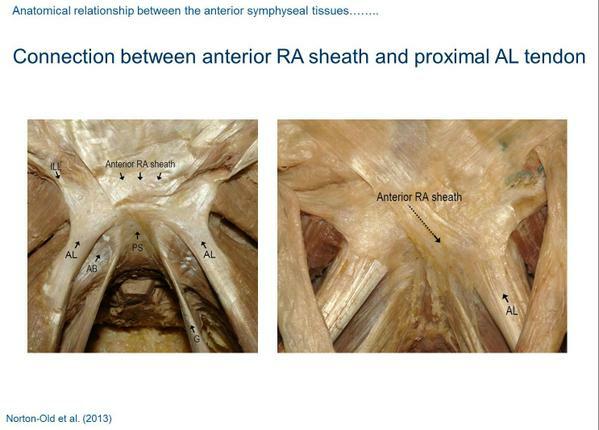 If we now consider that AL is the most commonly injured structure in the groin, could this be a cause of injury rates? At any rate, it is certainly a consideration worth knowing for healing times. Both Damian Griffin and Joanne Kemp (@JoanneLKemp) were keen to clarify the terminology of FAI. FAI relates to the pain caused by a CAM or Pincer lesion, CAM or pincer lesions don’t necessarily mean FAI. “Athletes will undergo increased loads and greater demands on joints (ROM) than the general public, therefore impingements that are asymptomatic with ADL’s become FAI in sporting population” Damian Griffin. Rintje Agricola describes an increased risk of FAI in males, especially in a sporting population but most interestingly reports that FAI is not prevalent in the non-athletes – therefore are we looking at a preventable pathology? We believe now that CAM deformities develop around 12-13 years old (Agricola and Kemp), the same age that IGF1, key for bone development, peaks in adolescent males. ER and flexion increase weight bearing through the femoral neck and lateral femoral head, around the growth plate, so increased physical activity at this stage of development will promote bony changes on these lateral surfaces. The population most at risk would athletes specialising in one sport, say football academies, where they increase their training volume and intensities as they physically mature. If we understand this to be true, should we now seriously start to consider activity modification for children in this stage of development? Obviously we would need to understand stages and rate of physical maturity for individuals, and then there is a bigger debate of getting coaches on side for this change in loading. 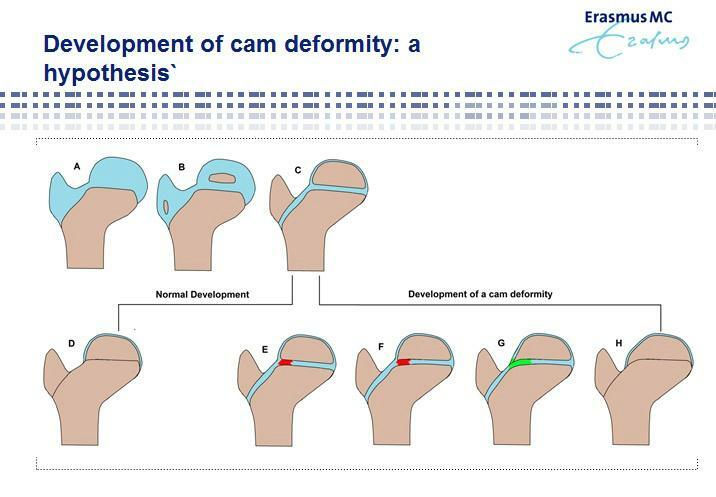 The presence of a CAM deformity may not cause FAI in all individuals. However Schache gives an example where a CAM lesion may actually provide a false positive, or exacerbate existing symptoms. If we assessing IR range through a flexed position, a CAM lesion may act as a lever on the pubic synthesis and increase stress in this area. So a detailed assessment and knowledge of individual hip morphology would help us differentiate between an impingement or pubic synthesis stress. Assessing through slight flexion, abduction and ER any extra articular impingement will be from the ischium up against the greater trochanter and our old friend, a CAM lesion. Griffin advocates the use of control and low speed with impingement tests, encouraging clinicians to explore the contact surface of the acetabular ring. So far through this summary, we have stayed very insular with our assessment and anatomy. Kemp encourages the clinician to consider the control of the trunk with hip pathology. An increased anterior pelvic tile will equal and increased acetabular retroversion and a decreased IR at 90 hip flexion. Sometimes, it may not be the presence of a CAM deformity reducing that range, so on this final point summarising the hip and groin, I wold encourage people to still consider the bigger picture of the patient and what role the hip / groin plays in a combination of movement patterns and dysfunctions. There is a great deal, and I mean a huge amount, that I have not discussed. Secondary cleft signs of the pubic synthesis or surgical interventions for hip & groin pathology for example. But one topic I have not discussed that is probably glaringly obvious is the treatment and management. In terms of exercise prescription, I think this will be led by your clinical abilities to diagnose the pathology (Remember Serners findings above, don’t just treat the scan!) Hopefully this summary will encourage to you read more of the presenters own works, or maybe it has re-enforced your understanding of what is a complex structure in the body. Essentially management of this area is much like any other in the body, we identify complications or restrictions and we address them. Usually this is a global approach, looking at the whole kinetic chain – remembering that this conference focused on a very key, but isolated area of that chain. If you are still reading at this point, thanks for taking the time to read through what is arguably the most complex and detailed blog I’ll probably every write! Screening: A window or just smoke? So this our first attempt at a blog and we have decided to make the task that little bit harder by co-writing it! 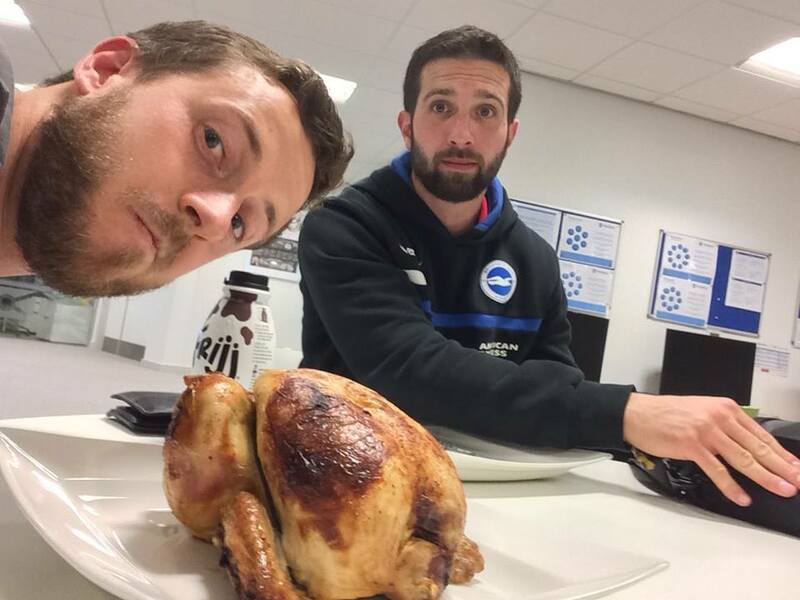 We hope to develop the blog as we progress covering topics (old and new) in the world of Sports Science and Medicine as well as delivering insights into our roles and how we work as part of a Multi-disciplinary team. We considered a few topics to christen our new blog, trying to emphasise the importance of communication and teamwork in a multidisciplinary team. Working in professional football, we have just conducted our end of season screening with all of our squads, from 1st team down to under-9s. The first thing we want to emphasise is that screening and testing is not the be all and end all of injury prevention and performance development. 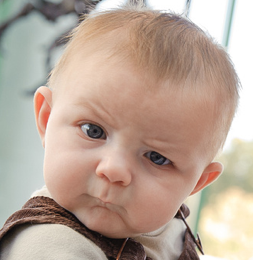 We ourselves are sceptics and regularly question what we are actually looking at and what the results mean. Are we testing what we think we are testing? However, if you can maintain this mind-set, the use of screening is very useful indeed. As an athlete experiences new exercise’s they will, through experience and adequate coaching, improve their understanding of what is required and therefore become better at that exercise. The tests that are used in the physical screening are, by nature, subject to the same learning effect. If the players struggle with an exercise at the start of pre-season, their naturally competitive nature means they will try harder at that test in the next screening. This can make it difficult to distinguish between actual improvements and the athletes increased awareness of what is required for a “good score”. Do they just get better at just that test or are they showing actual improvement?? It is basically impossible to cancel out the learning effect but by carefully selecting the other tests used in a testing/screening process we can try to identify common issues e.g. hip hike or knee valgus hidden in an Overhead squat may present itself in a single leg variation of a squat or lunge. It is also important not to coach the athlete through the movements so we can get a true picture of what movements come naturally to them..
Validity does the test you are using actually measure the thing you are trying to test for? And Reliability;are the scores/results consistent? Is it repeatable? Any test cannot be considered valid if there is no reliability in the test- if the test is not consistent and has no repeatability then the testing method is invalid. But away from all the formal data and testing environments, we continuously monitor other outcome measures such as heart rate variability, mood questionnaires, GPS data etc. as well as actually just looking and watching the athlete’s train and play. Essentially, this is screening all season, just not in our lab coats with a goniometer, optojump and a piece of paper. Screening should confirm or deny your clinical assessments. It should not guide your treatment, programming or management. We use a variety of single planar and multi-planar tests, looking at rotational control and anti-rotational control, speed, strength and jump tests but essentially these movements are building blocks to allow our athletes to play sport. Screening allows us to conduct controlled, repeatable tests to give us an indication (not a definition) of movement patterns, strength, speed and control, all invaluable measures that we cannot gain on the field of play. Essentially, if you know your players well enough, you should be able to predict who will have limited hip mobility, or who will produce the strongest isometric hamstring recordings, who requires additional speed or gym work, but you now have objective numbers and scores to work from so for your next screening date, you would hope to have influenced those scores.